What is it about mothers-in-law and towels? P.S. I’d like to dedicate this post to my brother Danny and his fiancée, Meg, who are getting married this weekend in Minneapolis! related: Those were the special towels! Douglas Adams would not approve. That Eliavy is one hoopy frood who always knows where his towel is! I believe this qualifies for Word Of The Day. 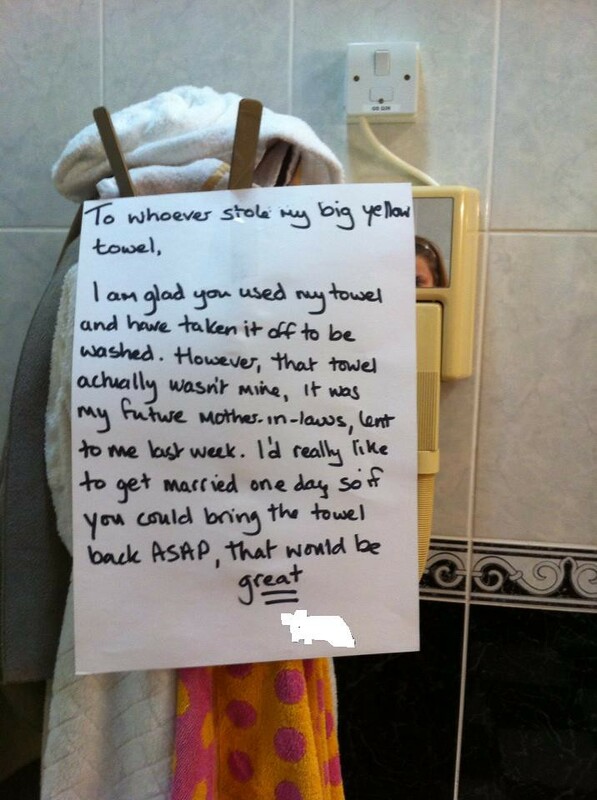 You lost your mother-in-law’s towel?! Time to panic. Time to break out the pan galatic gargle blasters in the hope that the resultant brain damage will mean that future MIL will forget she ever had a yellow towel, much less lent it to anyone….. But I don’t know where the towel is! How do you know the note’s not from a girl? That’s a girl in the mirror, after all. Completely sleeved out by the seemingly communal towel rack and swappage of towels in the first place. I don’t know how one can be sleeved out. I am intrigued by this. Does it involve sleeveless shirts? Or is it a shirt that once had sleeves but the sleeves were stolen and it is now sleeveless? I must know. Sleeved out is where you get goose bumps of horror so big you have to pull your arms in from you sleaves and hold them, skin on skin, against your torso to get your arms back up to temperature. I hate being the voice of reason. If only we had towel loaning mother-in-laws roaming the library where I work. A towel seems like kind of a random thing to borrow unless you are a house guest. Congrats to Danny and Meg! I hope many people give you special guest-only towels as wedding gifts. And remember, always close the cabinet doors. Why? – if you keep the cabinets open, then you can see at a glance how many towels you have left. Totally necessary to determine if it’s time to trudge down 2 flights of very long stairs to the laundry room, and run a load(s) of towels. In my house of you have to use the towels that are totally threadbare and date back to the early part of the millenium, it’s time to do laundry. Why I still have these, is a conundrum for the ages. You still have those towels to tell you when it’s time to do laundry. Without them, you’d never know and have to air dry while you wait for the dryer to finish. You have the towels for the same reason you have dwarf bread. You never truly feel soaking wet if there’s an old towel in your closet. It’ll sustain you for days. To commentators that can’t understand why anyone would ever need to borrow a towel or why they can’t just buy their own. I am from Florida. There are many opportunities to become drenched in many locations for various reasons. Beach, weather, pools, spills to name a few. Many people carry towels in their cars for this very reason. It’s just something we do. So the following situation is possible: Mother in law picks child and fiancee up for a meal. While out they get caught in downpour. MiL lets them use towels from car to dry off. Fiancee takes towel when dropped off to clean it for nice MiL . Also you can use towels for things that aren’t drying off. Maybe MiL had given fiancee something fragile, and fiancee used towel to safely get it home. These are only two examples. I want to know what kinds of lives people lead that none of these things would occur to them. That they couldn’t figure out a reason to ever borrow a towel. Too cheap? Really? Too smelly? I think she’d have given soap, not a towel. Amurana, see thread 1. Every hoopy frood who is any hoopy frood knows the importance of knowing where your towel is at all times. And you forgot to mention that it can be used as a self-asphyxiation device in the event of a spontaneous Vogon poetry recital. HA! I belong to a forum that is mostly Chicagoans and Floridians and posted this “everyone in Florida keeps a towel in their car” for that litany of reasons, and 100% laughed and said you’re off your rocker. What kind of forum do you belong to? “The Forum for Native Chicagoans, Displaced Floridians, and Redheads”? Too bad it’s not “The forum for Nobel Prize-winning Veterinarians”, or we might have settled the indoor/outdoor debate a long time ago. Heh. It’s a topix forum created by two different newspaper forums (Chicago Tribune, and a Florida newspaper). I don’t remember how they found each other, but when their own newspaper commenting format changed, they bailed ship and went to Topix. Gee, I thought all people in Florida had to worry about was snakes, gators, hurricanes, old women named Sophia who start out every story with “Picture this”, serial killers who kill other serial killers, and spies with burn notices. By “your big yellow towel” do you mean the one that used to be white and that’s got “Holiday Inn” stencilled on it? I.e. your yellow towel that isn’t yellow and isn’t yours? I would return the towel, but the bacon strip doesn’t seem to want to wash out. Should I use a different detergent? Errrrr….. You can keep it. I’ve heard of this fancy towel thing-MIL is not on this earthly plane anymore, so not sure what she would have been like. I HATE when people have fancy towels hanging & you KNOW you aren’t supposed to use them. I’m a rebel. F*ck it, I’m dabbing my hands dry on your fancy f*cking towels. When my mom died, all the kids got together in her house and used the best guest towels to wash for the week we were there. Then, we threw them away when we left because everyone was afraid to take them home…. Just in case there really are ghosts! So you weren’t afraid that she was going to haunt your for throwing away her mint condition guest towels for no good reason? Seriously though, that’s just wasteful. And kinda disrespectful. So you let superstitious beliefs make you discard perfectly good items that at least could have been donated? Odd. Tard: Christ Almighty, you might have at least dropped ‘em off at a homeless shelter… if your Moms’ shade had been wandering around looking for her towels, no one would even have noticed. Dudes, seriously, it was a joke. When my mom died, we would have gotten a plague-infested gibbon to sneeze us all dry before we would have used her guest towels. Judged on her looks by a bit of hair, a swath of forehead, and half an eye. Why oh why did you borrow a single towel from your future mother in law?